With equities breaking a new cycle low of sp'1992, the VIX made a new cycle high of 22.90. With equities clawing moderately upward in late afternoon, the VIX cooled, settling +6.0% @ 21.12. 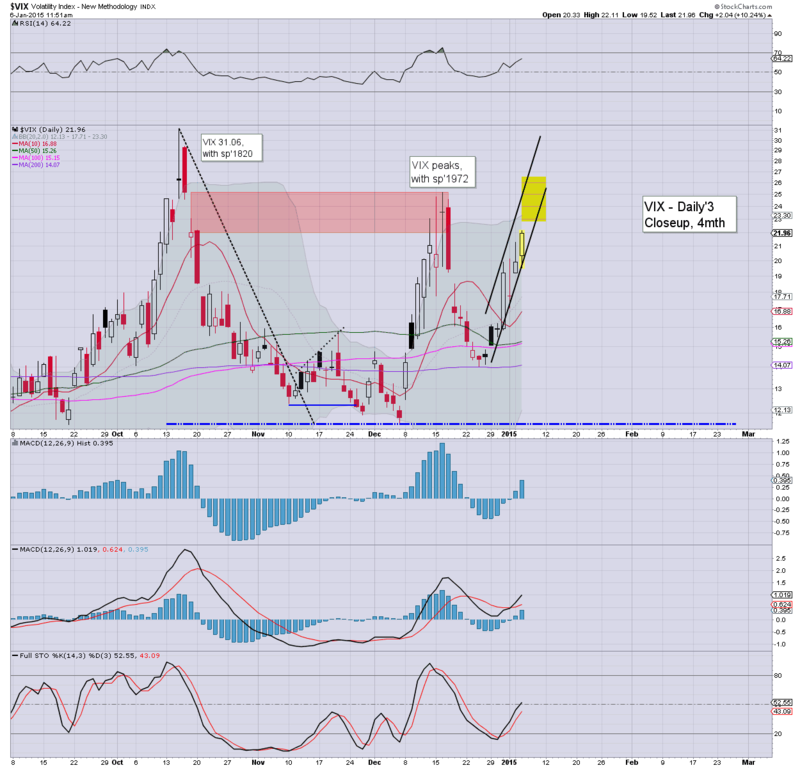 Near term outlook is uncertain.... but VIX still looks set to get knocked back to the low teens as the month proceeds. *at current rate of trend, VIX 25/26 will be viable on Wednesday, and 29/31 on Friday. 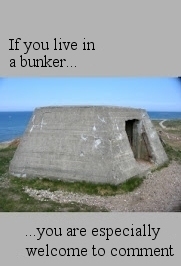 The latter seems highly improbable though. 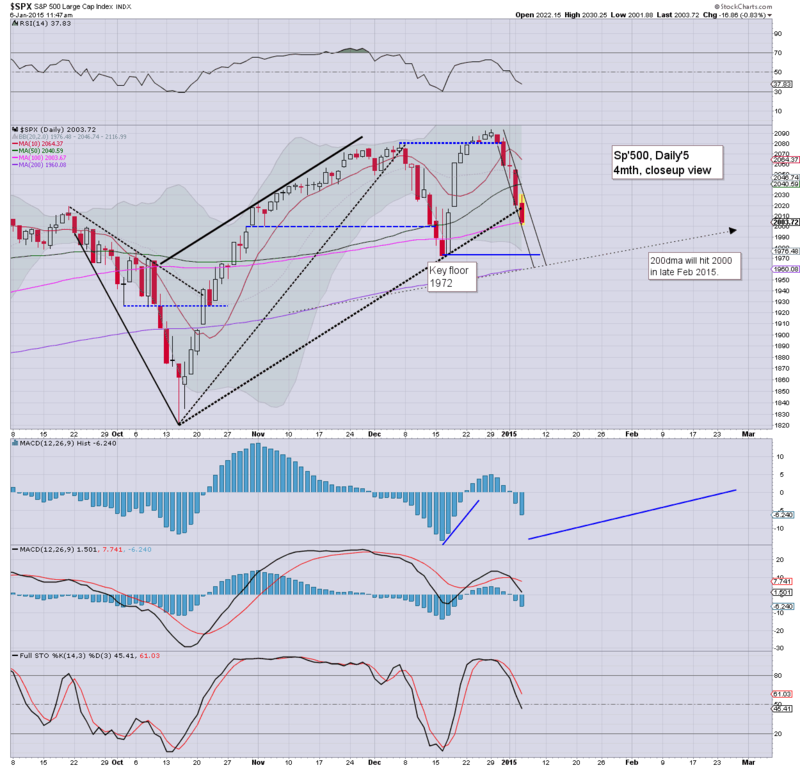 Suffice to say... a new cycle high...but the daily candle is suggestive that a top might now be in. In any case, the MACD (blue bar histogram) cycle is at the upper end of its natural cycle... equity bears have at best... a few more days before the VIX gets smashed lower again. US equity indexes broke new cycle lows (sp'1992, R2K 1153), closing moderately above the lows, sp' -18pts @ 2002. The two leaders - Trans/R2K, settled lower by -1.6% and -1.7% respectively. 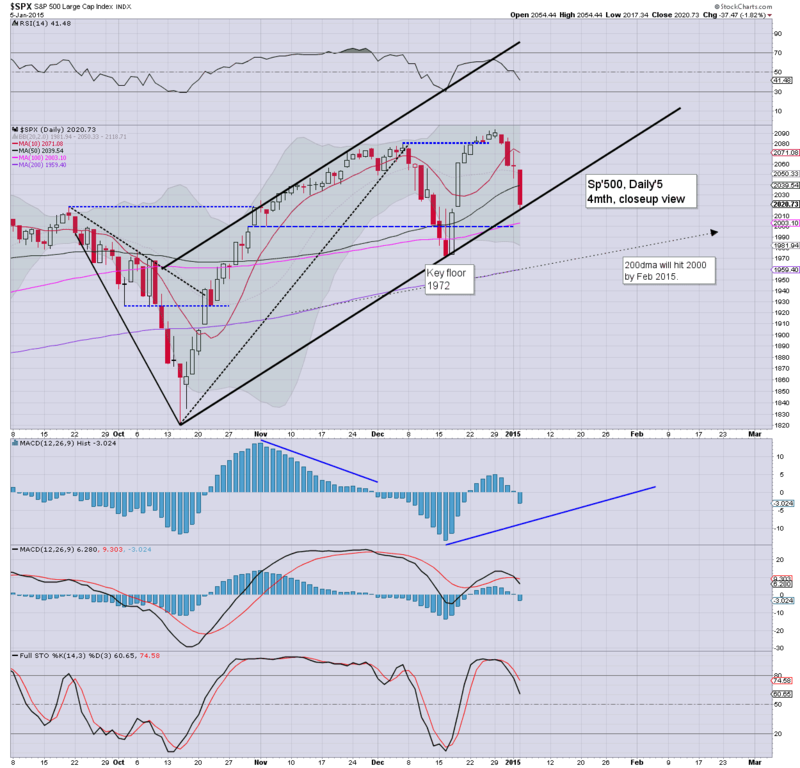 Near term outlook is uncertain.. with risk of another few days of downside to the 200dma around sp'1960.. within a broader up trend. * a choppy closing hour, but there is now a very viable spike floor of sp'1992, with R2K 1153. So... an interesting day in market land. On what was the fifth consecutive daily decline, the equity bears clearly did some technical damage today, coming within 1% of the pre-FOMC low of 1972. Overall though... we've seen this hundreds of times... and it always ends the same way. The US equity market is fighting to hold a viable spike floor, with the R2K of 1153 and sp'1992... along with VIX 22.90. The daily cycles are still in an outright bearish status... but as ever.. the up waves remain stronger.. and faster than the down waves. A fascinating day to be part of. Suffice to say.... its never boring at the world's most twisted and rigged casino. 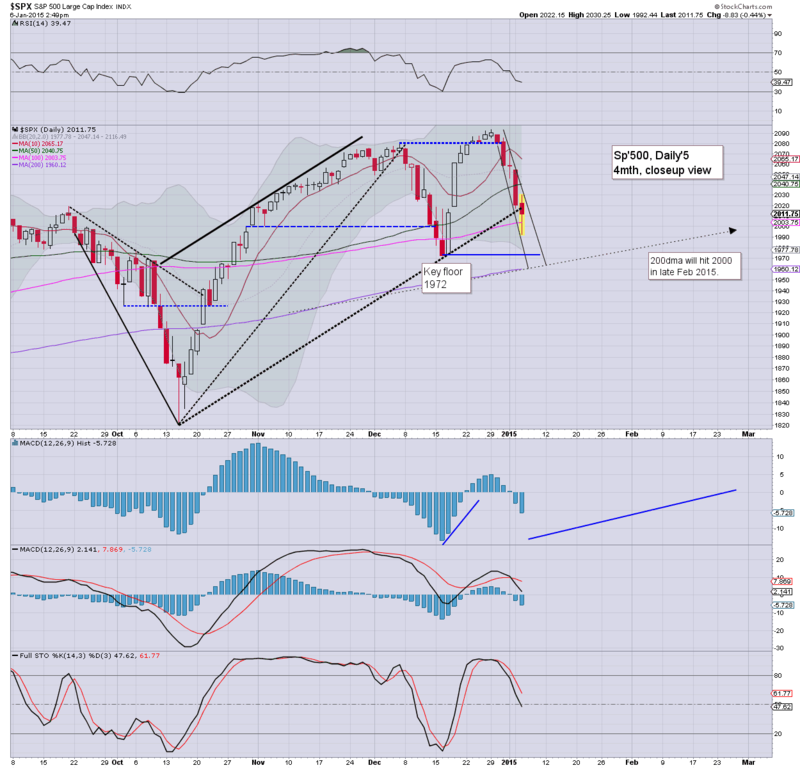 *it is highly notable that the monthly sp'500 cycle saw a bearish MACD cross this afternoon.... with MARCON 6. The last time that occurred was around Oct'14th... and we remember how that turned out... do we not? 3.07pm.. At the current rate... hourly cycles will attain a rather important bullish MACD cross in about 2-3 trading hours. So... by late Wed' morning... equity bears are facing something of a problem... not least with it being day'6. No doubt... the roaches will think otherwise... but then.. what else could they think? 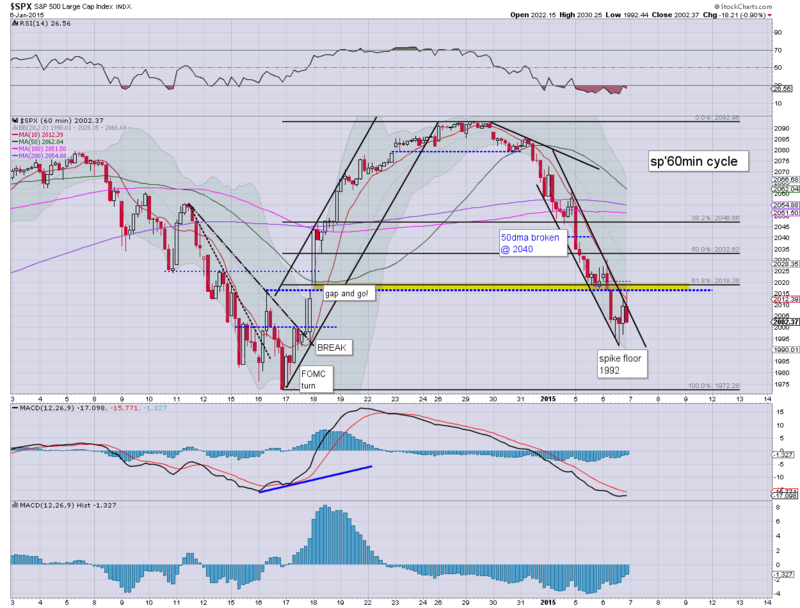 3.20pm... First target is the hourly 10MA... R2K 1170.... along with sp'2013... almost there already. 3.33pm.. VIX cooling, with a double spike top... hourly bearish MACD cross.... achieved.......equity bulls should be seeking a break <19 tomorrow.... along with sp'2025/30. 3.46pm.. chop chop... but we're a clear 1% above the earlier low.. with a rather interesting spike floor in place. US equities fail to hold the sp'2017 floor... and thus another little spiral downward has occurred. Next key support is the giant 2k threshold, but considering the near term market mood, a decline to the 200dma of 1960 is now on the menu. What is clear... the doomer roaches are crawling out of the woodwork today. 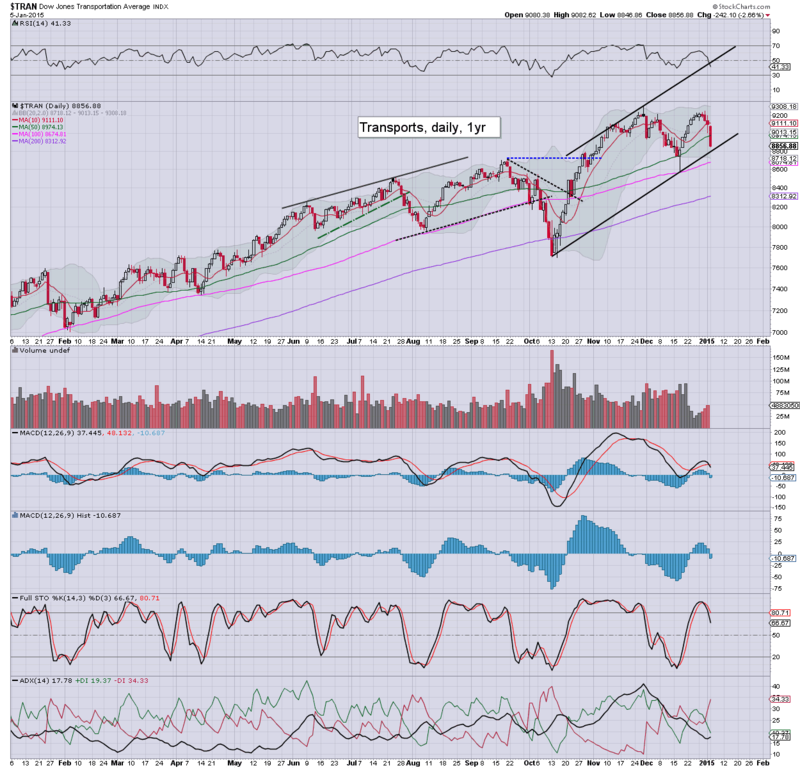 So... market is still on the slide, and now its a case of whether 2k.... 1970s..or the big 200dma. They are again starting to get noisy.. but then... it was expected. Clearly the economy is going to collapse because energy prices are 'too low'... right? Clearly.. a 25bps fed rate rise is going to KILL the system, right? Well.. that is what they are again loudly touting.... but then.... those same roaches have been saying that since 2011.. almost a full 1000pts lower down. Not even 5% from historic highs, and almost everyone gets hysterical over an imminent collapse. Truly... tiresome. US equities are seeing minor chop, which on some indexes is arguably a mere floor re-test. VIX is +2%, but not showing any real upside power. Metals are holding minor gains, Gold +$3. Oil remains very weak, -1.6% in the $48s. *it is typical turn time of 11am... if the market is going to hold the sp'2017 floor. now would be the time to see a definitive secondary low put in. So... rest of the day will be interesting. Can the market hold the 2017 floor... or another spiral down to 2000/1970s? I'm guessing... market will rally from either late today/tomorrow. Big jobs data on Friday.... its amusing how many seem to lose perspective so easily. Its like the majority only have a memory that spans the the previous 5-10 days... and nothing before that ever happened. 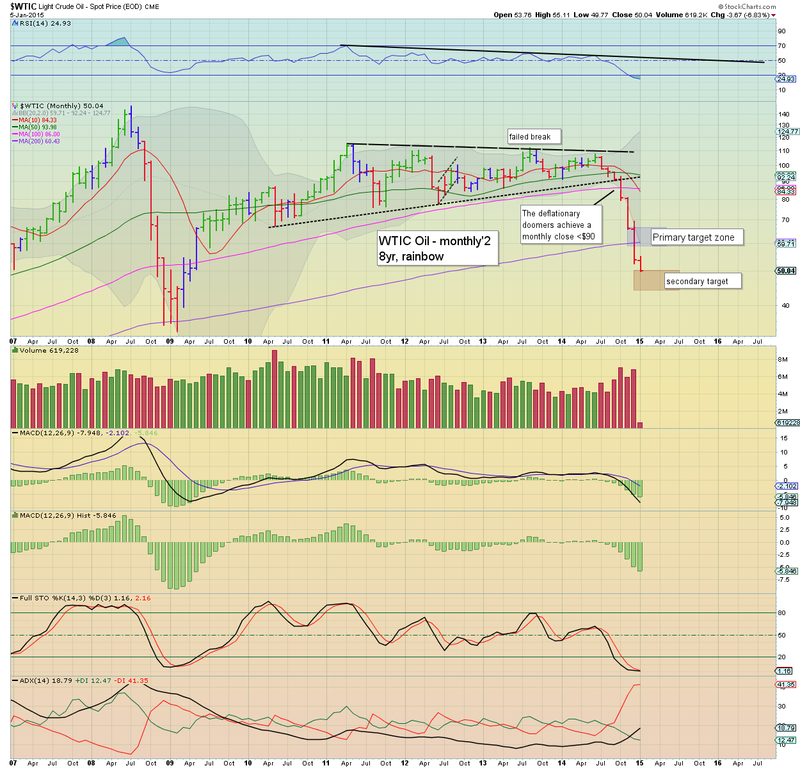 *I am long the R2K from 1176, will hold into Friday. Broadly, the 1250/75 zone looks viable in the next wave higher.. but that is clearly some weeks away. Regardless... I can't.. and won't take ANY of this crap seriously. PMI service 53.3, a touch below expectations. So... we're a little higher, but this is nothing for the equity bull maniacs to get excited about. Market looks set for another wave lower today.... although it might merely get stuck at yesterday's low, forming a double micro-low of sp'2017 or so. 10.15am. 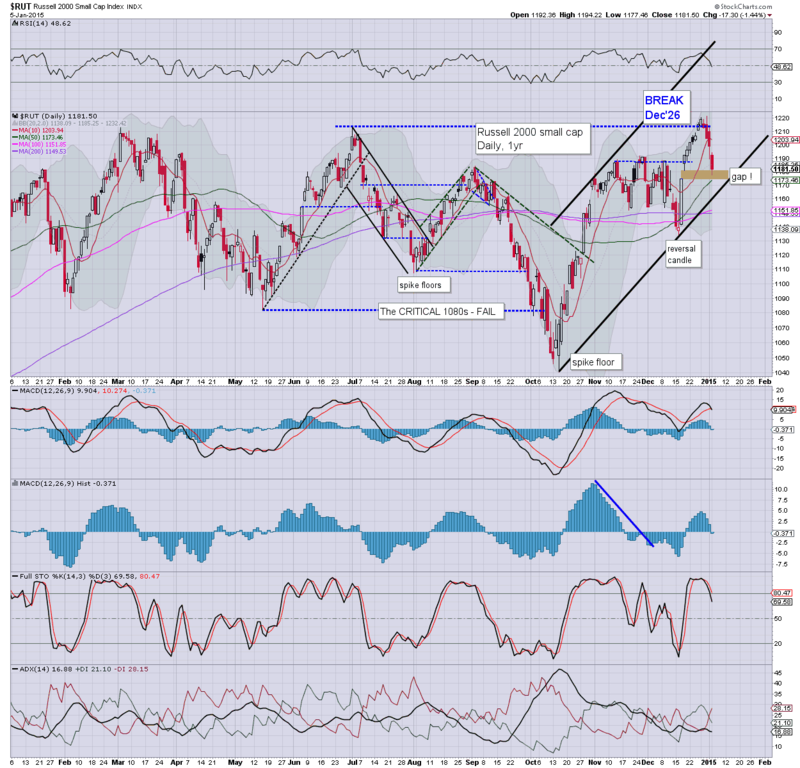 Long the R2K from 1176... will hold into late Friday. .... now its the waiting game. Watching clown TV, interesting to see how twitchy the cheerleaders are about ECB QE. They are absolutely desperate for more printing.. and that is with the US indexes a mere 3% from historic highs. Utterly... laughable. Good morning. Futures are a touch higher, sp +3pts, we're set to open at 2023. Metals continue to climb, Gold +$7. Oil remains in collapse mode -1.8%, in the mid $48s. So...a little higher to start the day but market will be highly vulnerable to renewed downside, not least with Oil still collapsing. WTIC Oil continues to slide, and today lost the key $50 threshold, settling -$2.77 (-5.2%). There is viable downside to the $47/43 zone in the immediate term. 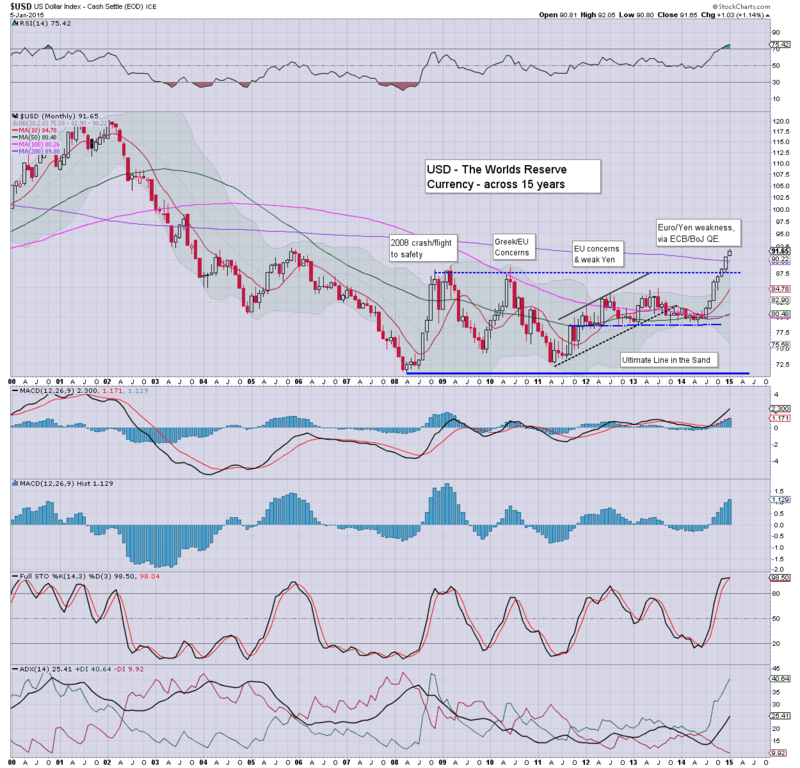 Meanwhile, with the Euro unable to hold 1.21, the USD continued to strengthen, +0.2%, headed for the giant 100 threshold. It is only the second trading day of January, and already, we're now in the secondary target zone of $50/45. The decline in Oil remains an exceptional event. The only issue now is whether WTIC Oil will floor in the 40s...or the 30s. Considering the utter lack of concern from OPEC... the latter seems very likely. The giant 100 threshold looks set to be hit this year... at the current rate.. by late spring. 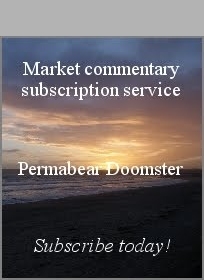 Tuesday will see ISM/PMI service sector, along with factory orders, that will certainly be enough to give the market an excuse to sell a further minor wave lower. US equity indexes settled broadly lower for the fourth consecutive day, sp -37pts (-1.8%) @ 2020. The two leaders - Trans/R2K, closed -2.7% and -1.4% respectively. Near term outlook offers a key floor within the next few days.. before new historic highs in late Jan/early Feb.
An interesting start to the week, but overall... the pre-FOMC low of sp'1972 looks unlikely to be broken in this down cycle. 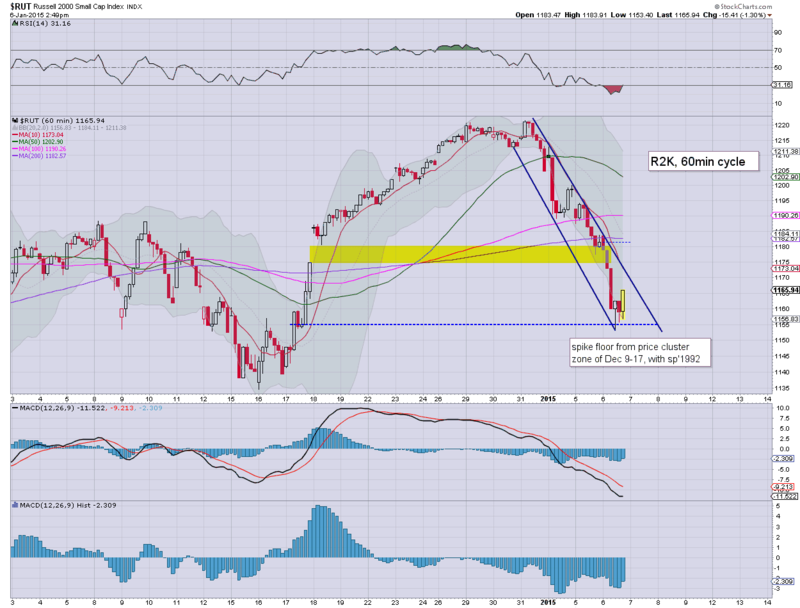 Most indexes have now filled the price gap zone... although the breaks of the 50dma's are something of a problem.